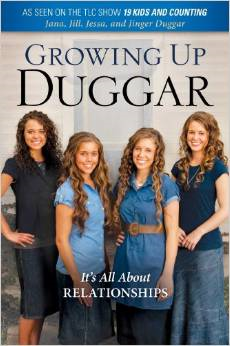 Growing Up Duggar: It’s All About Relationships is a book written by the four oldest girls of the Duggar family (from TLC’s 19 Kids and Counting) Jana, Jill, Jessa, and Jinger. The book is divided into sections that deal with all different types of relationships. Relationship with self, relationships with parents, siblings, friends, boys, culture, and the world. Relationship with God permeates the whole book and provides foundation for much of their values, convictions, and beliefs. The girls wrote this book to reach out to and help other young girls with relationships and navigating life as a Christian in this world. Throughout the book they share with their readers the wisdom of their parents, Jim Bob and Michelle Duggar. They also tell many stories about what it’s like growing up in such a large family. I was surprised to find that I actually really enjoyed reading this book. I am going to be honest and say that up until a friend asked me to read it I knew very little about the Duggars, and assumed they were crazy. However, after reading Growing Up Duggar I have a new opinion. This is a family who is totally focused on glorifying God and sharing His love with the world. I have a lot of respect for them and their willingness to put themselves before others in order to share the gospel. I also respect them for unashamedly following their convictions about what the Bible says is glorifying to God. However, while I agree with their convictions, I don’t necessarily agree with some of the ways they carry them out. At times, while reading the book I felt judged, like if I was to meet them they would think, “This girl calls herself a Christian?! She sure doesn’t dress like one!” just because I would probably be wearing pants instead of a skirt. I know that they most likely didn’t mean to come off as judgmental, but that’s the feeling I got. I guess what I’m saying is that in their lives and upbringing they seem to focus a lot on avoiding sin instead of living in the freedom of God’s grace. This verse has been coming up frequently in my life recently. Every once in a while a Bible verse or principle seems to follow me around. It will come up in sermons, books I happen to be reading, and conversations. It seems like the Holy Spirit is making sure I will never forget it and what it means. After a while it gets though my thick skull that maybe I should pay attention to what it is saying to me. So right now, James 1:22 happens to be the verse I can’t shake off. I find this verse (well really the whole book of James) very convicting. I’ve been wondering, ‘Am I a doer? Or am I a hearer?’ I guess I know in my heart that I am, for the most part, a hearer. But James makes me desperately want to be a doer. Let me back up and explain; a hearer is a person who probably goes to church, learns about the Bible, and believes it. The hearer puts their faith in God, but doesn’t let their faith change the way they live. They are stuck living the way they always lived: for themselves. Essentially, it is impossible for anyone to tell the difference between them and a non-Christian simply by their actions. Our sins need cleansing and no amount of tithing, feeding the poor, or honoring your father and mother can save you. You are probably thinking, ‘If I don’t need good deeds for salvation, then why should I bother?’ To be honest, I have struggled with the same question for a long time. What I have come to learn is, even though doing good things and obeying the law is not required for salvation, it is still necessary for living the spiritual life to the fullest. Helping people and following God’s commands are expressions of our love for Him. Through our actions we glorify Him and we show His love to others. So go do something! It doesn’t have to be a big something either! Often it’s the little things that add up to make someone a doer! If you want to learn more about becoming a doer please read Love Does by Bob Goff. It is an awesome read and really shows how becoming a doer of the word can change your whole life and make it more amazing! This time of year we sing and listen to many songs that are made just for this season. It always amazes me that despite the desire of many people to take Christ out of Christmas (even though it’s a celebration of His birthday!) we still sing the old Christmas hymns that glorify Him and His birth. Hark! The Herald Angels Sing is one of those songs. Often it’s sung at the end of holiday themed movies (It’s a Wonderful Life, anyone?) If you’re like me then you have probably spent years singing along to this song without giving a second thought to its meaning. Here I’m going to try to elaborate a little on them to show how meaningful they are. I’m not saying this is exactly what it means; this is simply my interpretation of the lyrics. In the last line of this first stanza it says “God and sinners reconciled.” This is one of the most meaningful lines in the song. Jesus was born so He could eventually die as a sacrifice for our sins. It is important to remember that as humans we are born in sin and we deserve punishment and death. God cannot have anything to do with sin. But, because of Jesus’ work on the cross we are saved and able to spend eternity in heaven with God. So, Jesus acts as a bridge or a mediator between humans and God. Through Jesus we are reconciled. This stanza reminds us to be joyful and join the angels in praise of God for sending His Son to be born as a baby and die for our sins. Again, this stanza reminds us of the purpose of Christ coming to earth. “Born that man no more may die.” He was born so that we could spend eternity in heaven with Him. “Born to raise the sons of earth/ Born to give them second birth.” Refers to what we might call being ‘born-again’ after salvation. At the moment of believing in Christ we are made into a new creation. One line in this stanza says, “Veiled in flesh, the Godhead see…” this reminds us that even though Jesus was fully human during His time on earth, He was also fully God. I love the line that says, “Light and life to all He brings,” He is the Light, and He gives us life. The previous three stanzas remind us that Christ is in fact, God. He left His magnificent place in heaven with the Father to come down to our level in order to save us lowly humans. We are also reminded to praise Him for who He is and what He has done for us. It is so amazing to me that God would become one of us! He must really love us a lot! Can you even imagine having been in heaven for ever and having all the power in the universe, then simply giving it up and being born as a human? Not only did He become human, but He was born and lived in the most humble circumstances. 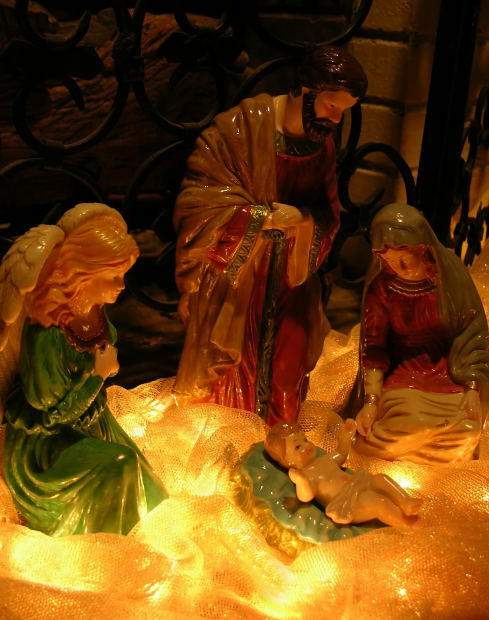 The savior of the world was born in a stable to humble parents with almost no recognition at first. It seems so crazy! To us it might make sense for the King of the universe to be born in a palace surrounded by magnificent and powerful people, but God never seems to do anything as we would expect Him to! The circumstances of His birth (Of which this song reminds us) are a glimpse of what His future ministry would look like, healing and helping the poor, needy sinners of the world. In a few days we will celebrate the holiday that kicks off the Christmas season. Over the years Thanksgiving has become one of my favorite holidays. 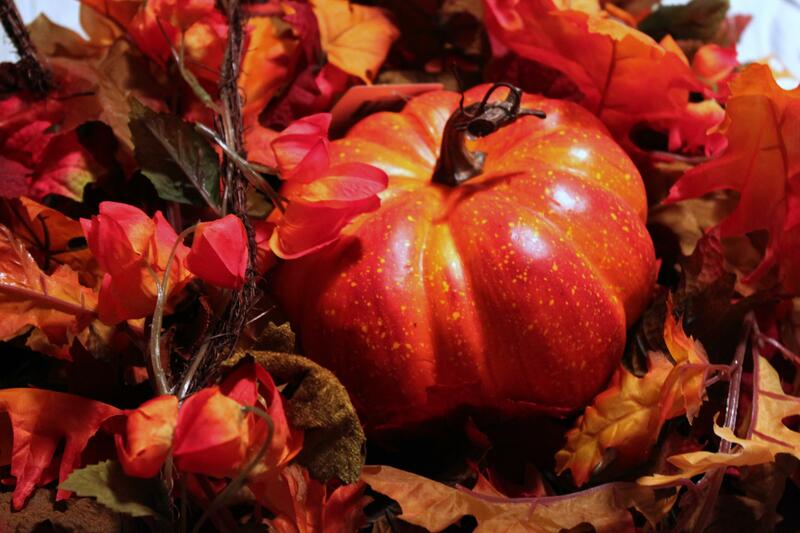 It’s a day to relax and eat good food (I can’t wait for that pumpkin pie! ), play games, and watch football, all with family and friends. But I have also realized in recent years that Thanksgiving is a somewhat forgotten holiday. It seems to me that its true meaning gets passed over and neglected. Sometimes it feels like Thanksgiving is that one last stepping stone into the Christmas Season, and so we rush through it. We talk often about the true meaning of Christmas and implore others not to forget, but nobody seems to be all that worried about the true meaning of Thanksgiving. We talk about the pilgrims and their journey on the Mayflower, but do we really understand what they were celebrating on that First Thanksgiving? They had come to the New World a year earlier with hopes of freedom to worship God as they chose and plenty of land to claim as their own. But they didn’t anticipate the hardships they would have to endure. They left Europe with 102 passengers, by the end of their first winter in Plymouth there were only 52 left; the others had died of diseases, starvation, and exposure. If the local native people hadn’t seen their troubles and helped them they never would have survived an entire year. So, on the First Thanksgiving they were celebrating BEING ALIVE. They were grateful for the food they had been able to harvest and the shelters they were able to build. They were thankful to be able to worship God freely. They were not thinking about standing in line for hours to get a good deal on a TV the next day. It seems funny to me that the biggest shopping day of the year occurs on the day after we are supposed to be thankful for what we already have. We are commanded in the Bible many times to GIVE THANKS. God wants us to be thankful and appreciate what we have been given. Not just material things, but our lives, families, health, and most of all the salvation we receive from Jesus’ work on the cross. I have found in my own life that when I make an effort to be thankful my attitude changes, I feel more content with what I have and it makes me want to share what I have been so graciously given. And so I would like to challenge you this year to take a few minutes to reflect on what you have been given and truly thank God for it before the craziness of this Christmas season takes over. This story takes place at a point in Jesus’ ministry when He was traveling around to various villages teaching and visiting His followers. He ends up visiting the home of the sisters Mary and Martha. These sisters are total opposites. One is a hard worker, the other could be considered lazy by some. But there are important lessons we can take away from their dinner party with Jesus. We see Martha hard at work preparing the elaborate meal for Jesus. She seems to be making sure that everything is just right for Him. Meanwhile, Mary is seated at the Lord’s feet just enjoying His presence and listening to what He is saying. Of course Martha questions this, and to be honest I probably would have too. Martha believes she is doing the right thing until she brings her complaints to Jesus and He gives her what I assume is a very different answer from what she was expecting. Jesus tells Martha that Mary is doing the right thing; she is concentrating on Him and His words. Martha is too distracted by her preparations to listen to what Jesus is saying, or to even enjoy being in His presence. He is implying to Martha that He doesn’t need a big, fancy meal; a small simple one would be enough. What He really wants is Martha’s full attention. Wouldn’t we all like to be the Mary in this situation? To be the one who can be at peace simply sitting at Jesus’ feet taking in His every word, undistracted by the busy-ness of the world. To be the one who always seems to have time to talk to a friend or comfort a child. However, I have a feeling that most of us end up being the Martha. Not that what Martha is doing is totally wrong. We need people who work hard and get things done. It is important to serve and help others. But getting caught up in the details of this world can hurt our spiritual lives if that is all we concentrate on. We can lose track of our own spiritual needs as well as those of the people around us. It is necessary to rest, be still, take in God’s word, and listen to what the Holy Spirit is saying to us. If we don’t do this we can quickly run out of steam and forget what the purpose of our work is, and then soon tire of what it is that is keeping us so busy. The purpose of our lives on this earth after all is to glorify God. However, it’s not a bad thing to want to work, serve, and help out; in fact it’s a good thing! But it can become a bad thing if it’s all you concentrate on and you miss both what’s going on both with the people around you and in your own soul. This week I have a book recommendation for our ‘Woman of Faith.’ Ruth Bell Graham was the wife of evangelist Billy Graham. She was an amazing woman who dedicated her life to glorifying God and serving others. I read her biography a few years ago, it was a great read, and I want to recommend it to you. It is titled ‘Ruth, A Portrait: The Story of Ruth Bell Graham.’ and was written by Patricia Cornwall. I recently happened to catch an interesting episode of Nightline on NBC called ‘Confessions of a Perfect Face’ which was all about plastic surgery. They talked about people’s motivations for getting cosmetic surgery as well as horrific things that can happen as a result of the surgery. It was just so weird and sad because these women who seemed so beautiful to me felt that they are ugly, that they needed to majorly change how they look. The segment of the show that worried me the most was about how more and more teenaged girls are having work done because they think they are ugly, or feel the need to be perfect. At first I thought, how selfish! Plastic surgery costs a lot of money, isn’t there anything better they can spend it on? Also, why would their parents allow them to do this to themselves? But this point of view has changed to pity. I feel bad for these girls who they think they are imperfect and ugly, and to such a degree that they have surgery to fix whatever they think is wrong. And so I just feel compelled to share with any girls who are reading this that you are perfect is God’s eyes. He made you in His image, and He thinks you are the most beautiful thing he’s ever seen! He has a plan and purpose for you that only you can fulfill. In my opinion, dramatically changing what He gave me as far as my looks would be like telling God that I think what he gave me is crap. Well here’s some news for you, God doesn’t make crap! I know, everyone has times where they think they are ugly and has parts of themselves they don’t like. I frequently have days where I’m unhappy with myself thinking, ‘If only I had this, or that.” Or, “I wish I was more ___.” At those times I try to remember to be grateful for what I have. I have eyes that can see and ears that can hear! I can walk! And so I want to challenge you to concentrate on God and His word as well as being thankful instead of concentrating on how you look on the outside. Many times when a person is joyful about something on the inside it shows through and their outward beauty is highlighted and accentuated by their inward beauty. Lauren Scruggs’ story is somewhat similar to Bethany Hamilton’s. She was seriously injured in an accident and lost her hand as well as her eye. In this interview Lauren speaks about the challenges she’s faced and what the Lord has taught her through her injuries.